Walter Foster Jr, 9781633223820, 96pp. Calling all kids that love to fish! Ranger Rick Kids' Guide to Fishing will teach you what you need to know to catch the biggest fish you've ever seen, and learn loads of facts about them, too. If you're like most young anglers, you don't care what kind of fish you catch as long as you get something. After all, while it's fun just to be outside spending time away from home (chores) and school (tests), fishing is the most fun when you catch fish. 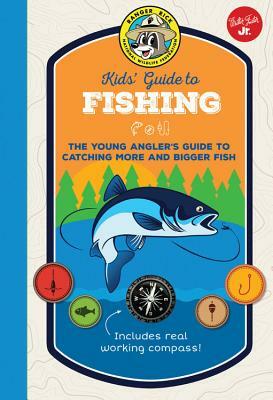 By reading Ranger Rick Kids' Guide to Fishing, you'll learn great tips for catching all sorts of fish. This book is also filled with little-known fish facts, like: Did you know that some of the fish you catch are older than you? It’s true! Just check out the fish age charts in this book! Also included is a real working compass to help you navigate through the wilderness. It won't take you long to read this book. That's good, because you'll have more hours for fishing! Bring this book along on your next fishing trip, because somewhere in these pages is the one thing that will make all the difference between going home empty-handed and catching the biggest fish of your life. Dave Maas spent five summers working as head instructor and guide at Camp Fish, an educational fishing camp for kids located in northern Minnesota. During this time he gave classroom seminars and on-the-water demonstrations on topics ranging from how to find springtime crappies to the proper method for releasing big muskies. For many years, Dave also served as an editor for the popular "Freshwater Angler" series of books.